I am selling the following Naniwa Super Stones and Semogue LE and SE brushes. All prices include CONUS shipping. PayPal. No trades please. I'm now using a coticule exlusively. I'm keeping my Chosera 1k for setting bevels and kitchen knives, and finding a new home for my Naniwa Super Stones. All stones have been lightly used and will be lapped before being shipped. These have only been used for my own personal razors, as I have never honed for anyone else. The new Naniwa Super Stones are the same size as these, but now come as a bare stone without the plastic base and thus require the use of a stone holder. I have priced the 3k and 5k at about 65% of their new price at SRD, and the 8k and 12k at about 75%. Note that the SRD price does not include postage. Additionally, the 8k and 12k currently available at SRD do not have the stand. 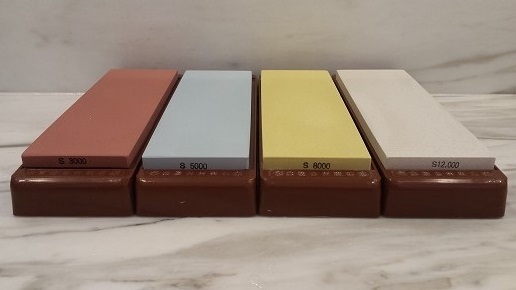 From left to right are the 3k, 5k, 8k and 12k. My preferences in brushes have evolved and changed over the years. At this point my interest is in two-bands and synthetics. These need a new home. Two Semogue 2011 LE Finest Bristle 1 (No. 25 and 50). This brush became my favorite boar, which is why I ended up with two of them. Its listed specs are a 25mm knot set at a 50mm loft. Soft, with backbone and no scritch. No shedding or cosmetic issues with either brush. 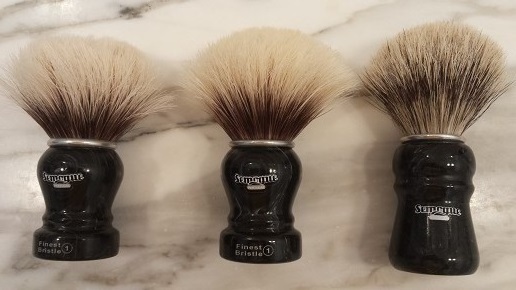 If you like the classic Semogue splay you will love this brush. Most boars tend to have a high loft and this one works exceptionally well at a lower loft. This is a must have item in any Semogue collection. I don't feel any difference in the performance of the two brushes. No 25 is on the left and No. 50 is in the middle. Also available is the 2012 Semogue SE, with a mix of Finest badger and Semogue's top grade of boar. It's listed specs are a 24mm knot set at a loft of 52mm. Great backbone and scrub, with a hint of scritch and a nicely shaped bulb knot. No shedding or cosmetic issues. It's the brush on the right. Semogue 2012 SE still available. All other items sold. +! for the 2012 SE. It's one of my favorite brushes--certainly not the most soft, but definitely the most unique. 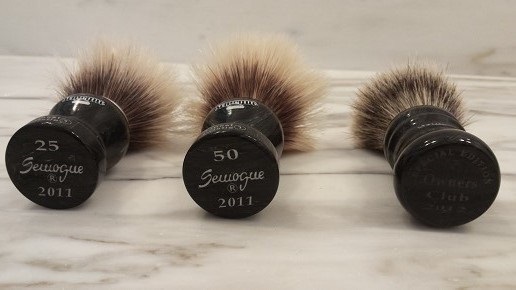 Has a very cool "bushy" feeling to it, and one of the best handles Semogue has released. 2012 SE is an excellent brush!! I don't see a price? Sorry, on my phone maybe I'm missing it?